Cancer is one of the most dangerous diseases and everyone knows that it is a lethal disease that requires a lot of money for the proper medication and treatment. But, we all know that it is not easy for an ordinary man to spend a lot of money on treatment and medication. It is very difficult to collect a huge amount of money to spend on the treatment required for its cure. In such situation, cancer insurance plan is an effective way to reduce the burden of cost of cancer treatment. Cancer Insurance is the type of supplement health insurance plan that helps to cover the risk of cancer and reduce the expenses of cancer treatment. It is specifically designed to cope with the modern time medical expenses covering additional cancer cost that may be covered by one's current policy. You need not have to possess a pre-existing cancer condition to be eligible for insurance. 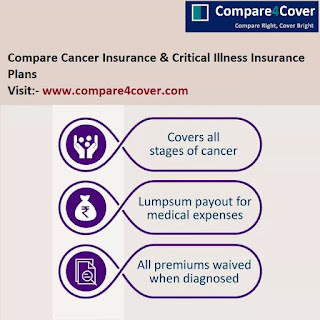 What Does Cancer Insurance Plan Cover? Insurance coverage for Cancer varies based on the insurance company and policy details but most plans cover both medical and non-medical expenses. Medical expenses include extended hospital stays, medical tests, procedures like stem cell transplants and other diseases specific treatments and more. Some of the non medical expenses include home health care, loss on income benefits, child care expenses and dietary restriction aids. Before buying a cancer insurance plan, it is quite important to understand that what is covered in the policy. You should also be careful to compare the benefits with your current health insurance planto see if there is any overlap in coverage. It is not necessary to buy a new cancer insurance policy plan if your existing health insurance plan covers all the events. Is there a need for Cancer Insurance Plan? There is always a discussion about disease specific health insurance plans, like cancer insurance. Some people firmly believe and support them, while others think that it is just waste of money as they are junk plans and are rarely needed. But according to American Cancer Society, one into two men and one in three women can develop cancer in their lifetime. And to overcome this dangerous disease expenses, there is a step you can take to overcome expenses on diagnosis of cancer. If you have strong family background of the history of cancer, then it is better to go for insurance plan for the decease cancer. People with strong family background may look at the current health policy and how can current plan include cancer insurance. So, it is better to go for insurance policy for Cancer to reduce the cancer treatment expenses if it has been diagnosis. While considering India, there are three affordable health insurance plans that are run by the state government. Consumers can surely get benefitted by these if they are eligible for the benefits. This program is a very handy one offering limited health benefits to India residents. If consumers are unable to purchase health plans due to a preexisting medical condition, they can see if they qualify for this program and get benefits. Healthy Families Program offers Indians with low cost health, dental, and vision coverage. This is mainly geared to children whose parents earn too much to qualify for public assistance. This program is administered by MRMIP. Access for Infants and Mothers Program provides prenatal and preventive care for pregnant women having low income in India. It is administered by a five-person board that has established a comprehensive benefits package that includes both inpatient and outpatient care for program enrollees. • Floridians who lost employer’s group health insurance may qualify for COBRA continuation coverage in India. At the same time, Floridians, who lost group health insurance due to involuntary termination of employment occurring between September 1, 2008 and December 31, 2009 may qualify for a federal tax credit. This credit helps in paying COBRA or state continuation coverage premiums for up to nine months. • Floridians who had been uninsured for 6 months may be eligible to buy a limited health benefit plan through Cover India. • India Medicaid program can be tried by Floridians having low or modest household income. Through this program, pregnant women, families with children, medically needy, elderly, and disabled individuals may get help. • India Kid Care program can help the Floridian children under the age of 19 years and not eligible for Medicaid and currently uninsured or underinsured. A federal tax credit to help pay for new health coverage to Indian who lost their health coverage but are receiving benefits from the Trade Adjustment Assistance (TAA) Program. This credit is called the Health Coverage Tax Credit (HCTC). At the same time, Indian who are retirees and are aged 55–65 and are receiving pension benefits from Pension Benefit Guarantee Corporation (PBGC), may qualify for the HCTC. • Virginians who lost their employer’s group health insurance may apply for COBRA or state continuation coverage in Indian. • In Texas, insurers cannot drop Texans off coverage when they get sick. At the same time, Texans who lost their group health insurance but are HIPAA eligible may apply for COBRA or state continuation coverage in Indian.